Brockton, Mass. – BC High coach Norm Walsh had no plans of using Mike Vasil, but once into the game the Eagles' ace ended it in a hurry. With BC High seeing a 6-0 lead dwindle to a mere run with two outs in the top of the eighth, Walsh turned to his star right-hander to close the door. Vasil came on and did just that striking out four consecutive hitters on 14 pitches as No. 1 BC High defeated No. 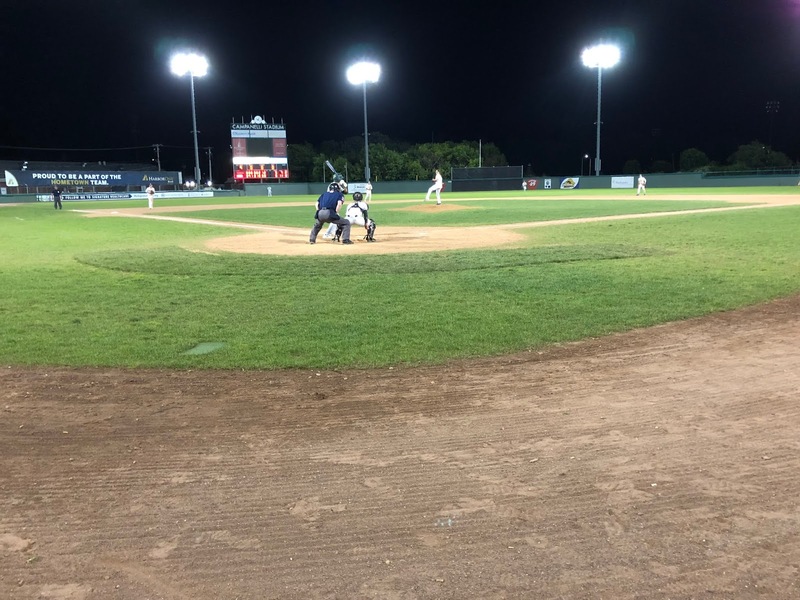 2 Wachusett, 6-5, to advance to the Super Eight Quarterfinals on Tuesday night at Campanelli Stadium. BC High will face Walpole on Wedensday afternoon at 4pm with a trip to the semifinals on the line. Wachusett, meanwhile, finishes the season with a 21-4 record. Down 6-3 entering the bottom of the eighth inning, Wachusett mounted a rally as three straight errors, a fielder’s choice, and a wild pitch pulled the Mountaineers within two. Cole Durkan then laced a two-out RBI single into left center field to trim the Wachsuett deficit to 6-5. On came Vasil who proceeded to strikeout Barry Walsh on three pitches, before fanning the side in order in the ninth to perverse the Eagles’ win. BC High used a four run second inning to jump on top early. Two walks and a single loaded the bases, and John MacDonald grounded an RBI single to left to put the Eagles on top 1-0. Luke Murphy was then hit by a pitch, and Bobby DeMeo lofted a sacrifice fly to right to increase the Eagles’ lead to 3-0. Marty McCormack’s RBI single to shortstop moments later capped off BC High’s four run frame. The Eagles added a run one inning later as Dave Driscoll laced an RBI single to left that made it 5-0 BC High. BC High starter Tim Albert kept Wachusett’s bats at bay through the first five innings. Albert shut the Mountaineers out over those five frames allowing just three hits while striking out eight. Sean O’Connell then provided the Eagles with some breathing room. The junior first took a 1-0 fastball the other way for a solo home run to left to increase BC High’s lead to 6-0 after five full innings. O’Connell finished the day 3-for-4 with a pair of runs and the aforementioned home run. Trailing 6-0, the Mountaineers clawed their way back. An error, Eddy Beauregard double, and consecutive walks got Wachusett on the board and knocked Albert out of the game. After a double play made it 6-2, Wachusett loaded the bases. Eagles’ reliever Mike Dragon got ahead of Francis Ferguson 1-2, but on the ensuing pitch the Mountaineers’ two-hitter lined a curveball into left centerfield that looked bound for extra bases. BC High center fielder Luke Murphy, however, dove across his body full extension for the final out of sixth. One inning later the Mountaineers drew closer as a walk, a Beauregard single, and a fielder’s choice brought home their third run of the game. Two pitches later, a Charlie Devin curveball rolled to the backstop bringing home Kevin Skagerlind to pull Wachusett within 6-4 and setting the stage for Vasil’s entrance. “Mike (Dragon) got us the double play and then just lost the plate a little bit,” said Walsh. “I thought Charlie (Devin) threw great. He got about six or seven outs in that eighth inning."